One way to tell if there is an issue with your vehicle is if the check engine light illuminates. This light can mean one of many things, from a loose gas cap to a seriously misfiring engine. It is important to bring your vehicle in at the first sign of the issue because we can inspect it to ensure that everything is working efficiently with one another. If you ignore the warning, and you could end up damaging other components. It also can be a sign that your vehicle is getting poor fuel economy and emitting higher levels of pollutants. If the check engine light illuminates, it will either blink or remain constant, depending on the problem. Either way, you should have the vehicle checked, although a blinking light or, on some cars, a red light instead of a yellow/orange light indicates a problem that needs immediate attention. In late-model cars, a blinking light usually indicates an engine misfire so severe that unburned fuel is being dumped into the exhaust system, where it can quickly damage the catalytic converter, requiring an expensive repair. 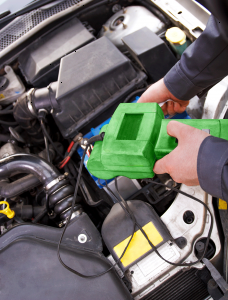 If the check engine light turns on, look for any serious problems that might cause the issue. Check the dashboard for any other lights that might illuminate as well. Another tip to do is to tighten the gas cap. This may resolve the check engine light that is on. You can also bring the vehicle in and we can inspect it for any issues that it might have. This can help you to have a reliable vehicle when you drive.